I love this time of year when everything is so new again; there’s a fresh start as the sun warms and the days get longer. Well, I’m not so sure about the sun bit yet, but you know what I mean. It’s a busy time in the wine world too, with lots of springtime wine news and things happening. Sainsbury has extended its organic range with the addition of a prosecco, a sauvignon blanc and a French rosé. This comes on the heels of the wines So Organic Malbec (£6.50), So Organic Côtes du Rhône (£7.50) and So Organic Merlot (£6.50) which launched last November. Sainsbury say they saw a 25% jump in demand for organic wines last year, which they believe is driven by younger customers. So Organic Prosecco (£10, 11% abv) isn’t cheap when you consider how much you can spend on a bottle of prosecco these days. It’s not a DOCG designated wine (the top style of wine in Italy) unlike my favourite prosecco from Sainsbury, Taste the Difference Conegliano Prosecco which comes in at around the same price. Saying that, I shared a sniff and a dip of So Organic Prosecco with some girlie friends, including lots of swirling and chatting, and the aromas got a thumbs-up; pears, tropical fruit, a little bit of cinnamon (I don’t know where that came from) and freshly sliced apples. The label on So Organic Sauvignon Blanc (£6.50, 13.5% abv) declares the wine has “citrus and grapefruit flavours and a delicate herbaceous note” but I found the opposite. It is from Spain and the sun-dappled grapes have delivered a wine of tropical fruits, guava and a hint of nectarine. So Organic French Rosé (£6.50, 13.5% abv) is grenache-based and has squishy strawberry aromas with a hint of spice. Over at Tesco, a new selection from Domaines et Chateaux has arrived on the shelves. The team searches for smaller parcels of French wines and once they’re sold out, that’s it, they’re gone. I read today that that is something called WIGIG – when its gone its gone. It sounded more like a 70s folk group to me. Hey ho. My favourite of the new four wines I tasted was Domaine Bariol 2016 (£9, 13% abv), a white from the Côtes du Rhône. It is a blend of marsanne and viognier and has a nose of white peach and honeysuckle with a peep of candied fruit. Those same notes carry through to the flavours and it was pretty much spot-on with my Sunday afternoon roast chicken and buttery bacon and cabbage. Bicicleta, is having a makeover. New bottles with a bicycle embossed in the glass are out next month with a nod to making the wine a little more premium. The bicycles are a tribute to the vineyard workers who travel around the Chilean vineyards on bikes. Cono Sur Bicicleta Pinot Noir (RRP £7.49, Tesco, Asda, Sainsbury, Morrisons, Co-op, 13.5% abv) is the UK’s best-selling pinot noir and its notes of strawberry, violets and cherries are smooth and tempting. Finally, Aldi has brought out a new range of half-bottles for those weekday nights when you fancy a tipple with supper but you don’t want a full bottle calling “finish me, finish me”. 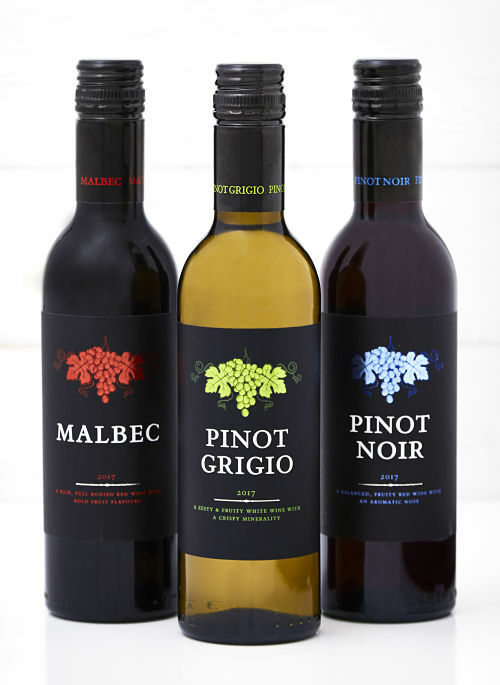 The wines are Pinot Grigio, Pinot Noir and Malbec and they are £2.99 for 37.5cl. Let’s raise a glass to Spring! Yay! !